Samsung Electronics has recently launched the new Samsung S8000 Jet which is expected to hit the markets in the last week of June. This unique phone comes with stylish looks and impressive high-tech features. The phone supports 2G, 3G network of type GSM and HSDPA. 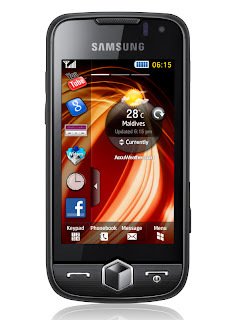 The Samsung S8000 Jet has an excellent display screen of 3.1 inches which is 800 x 480 pixels and of type AMOLED. The bright wide touch screen has 16 million colors which enhances the image and video quality of the phone. With the new Samsung S8000 Jet, the users can place various shortcuts on the home screen for easy navigation. The phone has an inbuilt accelerometer sensor for auto rotate and auto adjust between landscape and portrait mode. Samsung S8000 Jet comes with internal memory of 2 GB and supports microSD memory card for extending additional memory up to 16 GB. Samsung S8000 Jet has other high-tech features like GPRS class 12 type for connecting internet, EDGE technology of type class 12, Bluetooth version 2.1 with the facility of A2DP, 5 megapixel camera with auto focus and LED flash, GPS navigation system, Radio and high quality music and video player which plays DivX, XviD files directly without compressing and an amazing battery life of up to 422 hours (Stand by time) in 2G and up to 406 hours in 3G. Samsung S8000 Jet is certainly a revolutionary phone with the perfect mix of design and technology.